THE SKY I SCRAPE: Drumgasm! 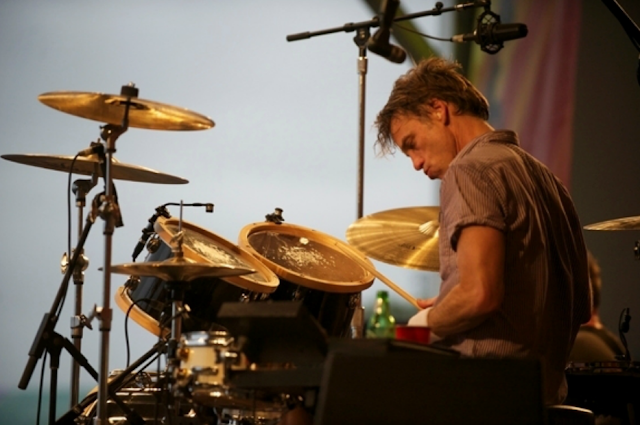 Jackpot Records has announced that Matt Cameron is joining drummers, Zach Hill (Death Grips/Hella) and Janet Weiss (Sleater-Kinney/Wild Flag), to form the all-drummer supergroup, Drumgasm. Their full-length LP is currently available for pre-purchase as a hand-numbered vinyl with a digital download for $14.99 (+$4 S&H). I’m in a unique position to comment on this music, as I actually scammed my way into the session, on the pretext of video taping the whole thing. Did I actually shoot some footage? I don’t even remember, because, sitting there in the room as it all went down, I was just transported by the spirit, the energy, the fire, which was being generated in large doses. Three people, three drum kits, some microphones and a reel of tape – that’s it: pure spontaneity. There’s nothing out there that’s very comparable to this - maybe the Voodoo drum ritual music of the Drummers of the Societe Absolument Guinin, is all I can think of, though admittedly even that is a pretty far cry.